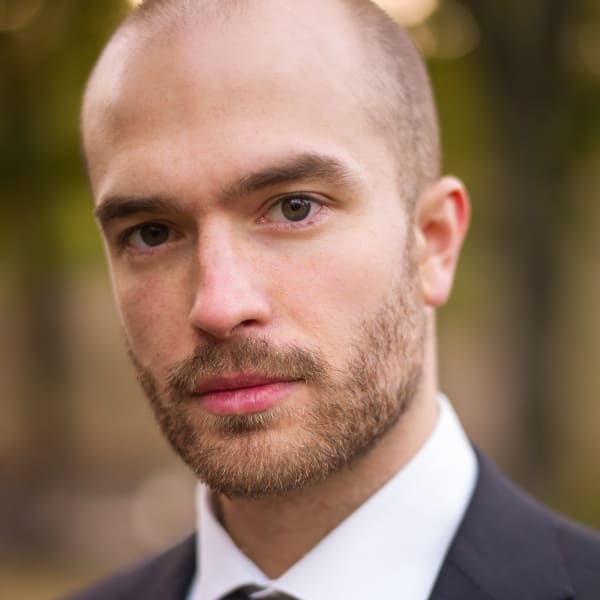 Baritone John Brancy is on the verge of an exciting and diverse performing career, hailed by the New York Times as “a vibrant, resonant presence.” Brancy was recently awarded the Top Prize at the 2018 Lotte Lenya Competition in New York, Second Prize at the 2017 Wigmore Hall Competition in London and prior to that won the media prize in the 2017 Belvedere Competition in Moscow and the Jensen Foundation Vocal Competition in 2015. He is also a past winner of the Marilyn Horne Song Competition. Of special interest is Brancy’s recently released CD, A Silent Night: A WWI Memorial in Song, with keyboard collaborator Peter Dugan. Their work together has taken them to the Music and Beyond Festival in Ottawa, the Central Chamber Series in New York and most recently, to Alice Tully Hall as part of the Juilliard Alumni Recital Series. On the opera stage, he appeared as Albert in Stadttheater Klagenfurt’s production of Werther and followed with a reprise of Malatesta in Don Pasquale, this time for Landestheater Vorarlberg in Bregenz. For Saint Thomas Church in New York, he was heard in Brahms’s Requiem. This summer, Brancy will be a featured soloist at the 2018 Carmel Bach Festival in Carmel, California, and returns to the Kennedy Center to perform his recital “Armistice: The Journey Home” with Vocal Arts DC. Next season, Brancy appears as the baritone soloist in Messiah with the Victoria and Johnstown Symphonies, as well as with Musica Sacra under the baton of Kent Tritle at Carnegie Hall. During the 2016-2017 season, the New Jersey native made important debuts at Florida Grand Opera singing the title role in Eugene Onegin, Clarion Music Society as Papageno in Die Zauberflöte, for Opera Omaha as the Steward in Dove’s Flight, and Opera National de Lorraine as Harlekin in Ariadne auf Naxos. Recent highlights have included his debut with the Glyndebourne Festival Opera Tour as Malatesta in Don Pasquale, his Opera Theatre of Saint Louis debut as Harlekin in Ariadne auf Naxos, Demetrius in A Midsummer Night’s Dream for Pacific Opera Victoria and Dancaire/Morales in Carmen for Opera Frankfurt. He returned to Carnegie Hall in recital as part of the “Evening of Song Series,” and his concert engagements have included the Boston Symphony Chamber Players, Edmonton Symphony, St. John’s College Concert Series, Chamber Music Society of Palm Beach, and Opera America’s 2016 Emerging Artist Recital Series in conjunction with the Jensen Foundation. Brancy has been engaged by Semperoper Dresden, Edmonton Opera, Paris’s Théaâtre du Chatelet, Opera Saratoga, and Opera San Antonio in works ranging from Tobias Picker’s The Fantastic Mr. Fox to Dandini in La Cenerentola to John Adams’s I Was Looking at the Ceiling and Then I Saw the Sky. His concert engagements included his debut with Musica Sacra in Handel’s Messiah at Carnegie Hall, where he has also performed a recital with pianist Ken Noda. Further recital credits include the New York Festival of Song with pianist Steven Blier, the Kennedy Center with Vocal Arts DC, the Collaborative Arts Institute of Chicago, and Société d’art vocal de Montréal in collaboration with pianist Peter Dugan. He has also appeared with the San Francisco Symphony, Boston Symphony, Kansas City Symphony, Brooklyn Art Song Society and the symphonies of Regina and Saskatoon. Brancy holds a graduate degree from the Juilliard School in New York.